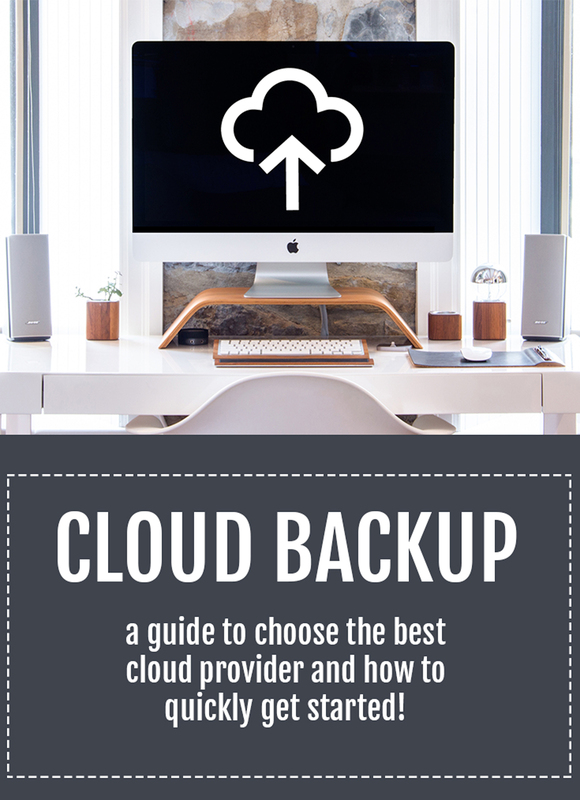 Cloud Storage Back Up Guide – We hear the term “the cloud” all the time. But what actually IS it? Why should you use it to back up your photos and videos? How can you take full advantage of the features and automation? 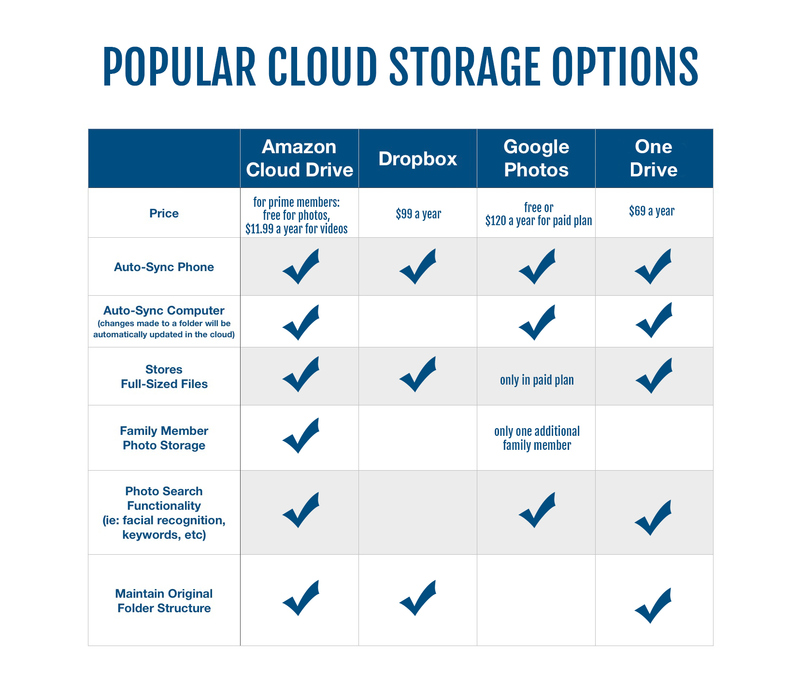 Here’s your complete guide to get started with cloud storage! What does it mean for my photos to be ‘backed up’? My rule of thumb is you must have at least two copies of your photos (ideally three)! One should be on-site, a computer or an external hard drive. One should be off-sitein the cloud. 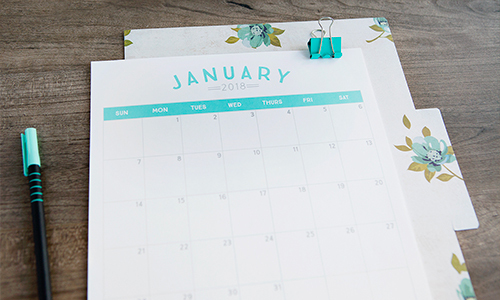 Having that offsite backup is critical because if there were to be a fire or flood in your office, it would wipe out your computer and any external hard drives at the same time. The cloud refers to services that run on the internet, instead of locally on your computer. Unlike the name implies, your files aren’t floating around in space, they’re saved on physical servers which are maintained by a cloud provider service (like Dropbox or Amazon). When things are stored in ‘the cloud’ they’re accessible from any device that connects to the internet, without taking up storage space. Pretty cool! Which cloud provider company should you use? It may surprise you that iCloud isn’t included on this list. Apple actually does not consider iCloud a backupservice- it is meant for syncing your photos across Apple devices (which it does quite well), but relying on iCloud for backup can make you vulnerable to data loss. Lesson learned: make sure you’re using something in addition to iCloud! My personal favorite cloud service is Amazon Cloud Drive (also called Amazon Photos). Not only is it the most affordable (prime members get UNLIMITED photo storage free! ), it offers amazing automation, and gives you multiple ways to view your photos (including searching with facial recognition)! How can I use the cloud to make it easier to find the photo I need? Most cloud services offer amazing search functionality! Search by person: facial recognition is so helpful! The cloud will identify people across your photo collection and you can assign names to the faces. Once they’ve been named, you can type that person’s name into the search bar to return photos of them. Very cool! Search by location: if you have location enabled on your phone, many of your photos will have location information embedded into the metadata. You can type in a city and see all the photos taken there. This is really helpful when trying to find a memory from a specific vacation if you can’t remember the date of the trip. Search by keyword: this is where it gets really cool. Type in ‘beach’ or ‘birthday’ to see certain memories, even if the file names or metadata don’t contain anything related to those terms! It is visually scanning your photos in the search! Technology is so cool! How can I restore my files from the cloud, if my hard drive fails? 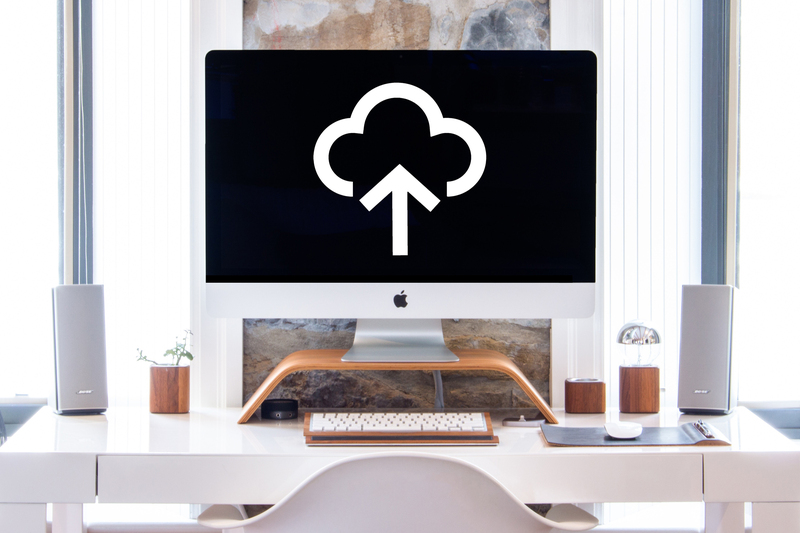 All four of the cloud services I mentioned above offer desktop programs to help you quickly upload + download your files from the cloud. This means you don’t need to fear hard drive failure anymore! If your hard drive crashes, you can restore all of your files from the cloud and you’re only limited by your internet speed. How do I get started uploading my files to the cloud? It’s easier than you think! Download the phone application AND the desktop application for your chosen cloud service provider and follow the instructions! That’s it! What if my digital photos are a HOT MESS and I don’t know where to start? 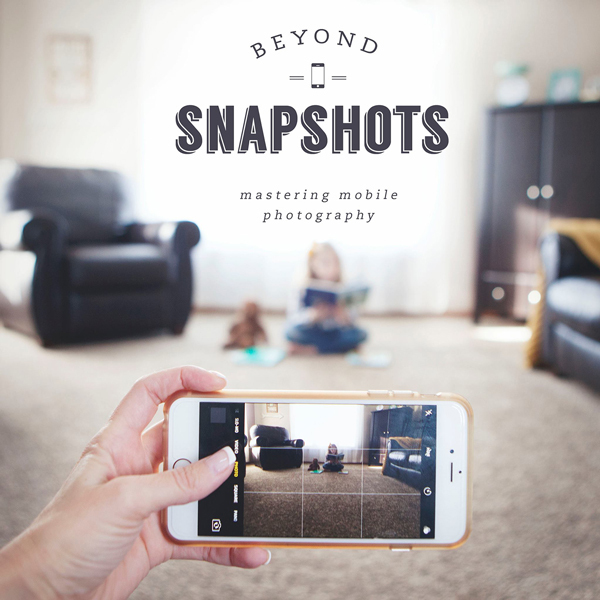 Get detailed tutorials for organizing your digital photosin the Backup Bootcamp online course! 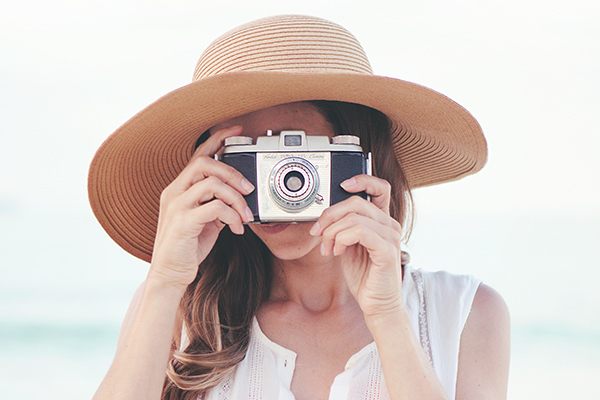 Learn how to get your photos into ONE place, automatically remove duplicates from your photo collection, sort everything into chronological folders (automatically! ), and watch step-by-step tutorials for each of the four cloud services mentioned in this post! Use the coupon code SIMPLE for $10 off Backup Bootcamp. It expires 2/28 so take advantage of this offer (the course rarely gets discounted) while you can! Casey von Stein, aka Miss Freddy, received the nickname “Freddy” at birth because of an unfortunate resemblance to a Flinstone. She’s outgrown the resemblance (thankfully), but not the nickname. She’s a kids photographer living in Golden, Colorado and is known for her ability to make kids act naturally in front of her camera. Casey loves to help others USE their photos in meaningful ways and in 2017 got certified as a Professional Photo Organizer. 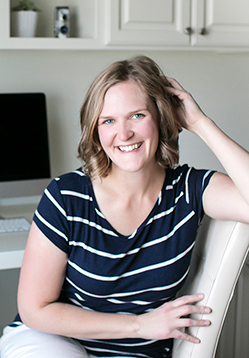 Follow her on Instagram or check out her blog for lots more FREE photo organizing tips! From what I understand, both Amazon & Google also allow themselves access to your photos. In other words: privacy issues—if you store your photos with them, they can use them however they see fit (which, actually, fits perfectly with their business model). Neither company earns gold (or even tin) stars for privacy protection. This is a very important consideration to me, and the lax privacy policies on those platforms should at least have been mentioned.